Some training courses and tutorials require software downloads, installations, hardware, and/or other "homework." Please review the instructions for each training or tutorial you're registered to attend and take action on the requirements before you arrive. Want Strata Data Conference info to go? Download the O'Reilly Events App packed with schedules and other essential data. If you need assistance with the app, please visit the Customer Service desk in Registration or send a message to @strataconf. 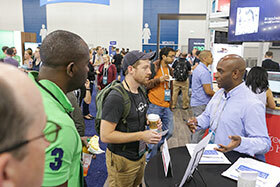 Visit the Attendee Directory to see who else will be at Strata Data Conference in San Francisco, contact other attendees, start topical group conversations, post job openings, take session notes, and more. Check out some tips for getting the most from the Directory. You must be registered for the event and have opted-in to the Directory to use it. Adding a training or tutorial to your personal schedule does not update the training or tutorials you are officially registered for. To see what you've registered for, check the Registration Selections section of your Account Dashboard. If you'd like to change your selection, you may do so in the Dashboard or by contacting confreg@oreilly.com. The Personal Schedule on the conference website and My Agenda in the mobile Events app don't sync yet. If you're registered for a training or tutorials and would like to change your selection or upgrade your pass, visit your Account Dashboard and click the "Change your registration selections" link in the Registration Selections section. To make other changes to your registration, please email confreg@oreilly.com. Have a question or comment for a speaker before or during the conference? Post them in the "Add New Comment" field found at the bottom of any session detail page. Please keep in mind that your comments will be public. Follow @strataconf and #StrataData for conference news and updates. Located at Level One Lobby, make Registration your first stop to check in and pick up your badge. Please have a Photo ID ready when checking in. 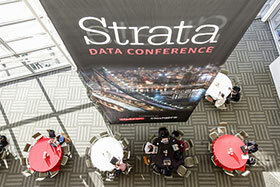 You'll receive your "Strata Data Conference in San Francisco Check-in Code" email about a week before the event. This message contains your check-in QR code that you can scan to check in at the conference, either from your smartphone or a printout. If you're speaking at the conference, please go directly to the Speaker Lounge, located in room 3014, Level Three of Moscone West, to check in and pick up your badge. Wireless connectivity will be available throughout the conference area. Keep in mind that you're sharing the network with your fellow conference attendees, so please refrain from downloading large files while on the conference network. If you need assistance getting online, please visit the Customer Service desk in Registration or send a message to @strataconf. Want to make new professional connections during the conference? Please be sure to observe the Code of Conduct during all conference activities. Your conference pass includes a free 90-day membership to O'Reilly online learning. You'll have on-demand access to live training courses, in-depth learning paths, interactive coding environments, and a vast collection of books and video (including the recordings from this conference and other O'Reilly events)—all from the smartest, most innovative experts in tech and business. Stop by the O'Reilly booth to activate your membership. Your feedback is very important to us! Click on the set of stars and/or leave public comments on any session detail page on the website. You can also rate presentations using the evaluation button in the Events App. All participants must follow our Code of Conduct, the core of which is this: the conference should be a safe and productive environment for everyone. 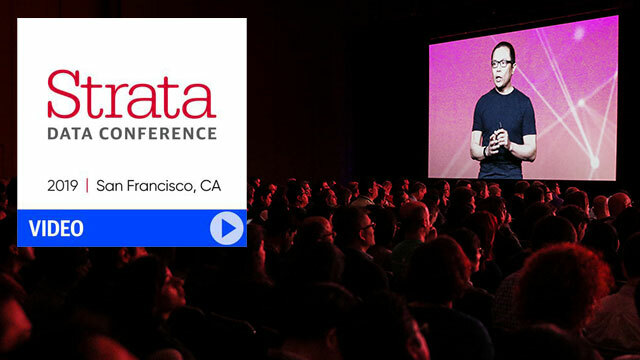 We invite you to help us make Strata Data Conference in San Francisco a place that is welcoming and respectful to all participants. Read more. Presentation slides will be posted as speakers share them. Keep in mind not all speakers will share their presentations. Our goal is to capture the excitement of our conferences, and you may see photographers or videographers (including ones we've hired) documenting this event. Photos or videos taken by or on behalf of O'Reilly may be posted on one or more of our sites or used in future marketing materials and publications. We also encourage attendees to share their conference experiences through social media. It's possible that you would appear in some of these shots. We invite you to speak directly with any photographer if you have concerns about their activities. Please note that audio and video recording or broadcasting of presentations (keynotes, sessions, tutorials, workshops, and training courses) by attendees is not permitted. If you need a private, nearby space for pumping or breastfeeding while you're onsite at the conference, the nursing room is located in Overlook 2024 on the 2nd level. This facility is compliant with all ADA requirements for accessible design. Find out more about the venue accessibility. Bay Area public transportation accessibility overview and information. An all-gender restroom is located on the 3rd floor near room 3024. Everyone is welcome to use this restroom regardless of gender identity or expression. If you need a place to store your coats or bags, a coat check room is available Monday through Thursday in the 1st floor lobby. Misplace a personal item while at the conference? Stop by the Customer Service desk at Registration to see if it's been found. You can also drop off any found items there. Looking for a good restaurant? Need to buy a gadget? Check out the following guide to businesses and attractions near the conference. All of the conference keynotes, tutorials, and sessions are being recorded (pending speaker consent). This video compilation will be available for viewing in O'Reilly online learning about three weeks after the conference ends. Please note: If you have a Platinum or Gold pass, the video compilation will automatically be added to your O'Reilly Account.